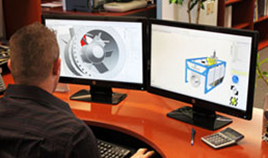 Morrison Pump Company has combined years of engineering knowledge and technical experience into our pump & system designs, while incorporating our customer needs into our product standard features and options. Hydraulic design, material selection, and detailed mechanical design drive the essence of our engineered products, which translate into high efficiency, durability, reliability, and maintainability. Furthermore, we continually strive to improve our design and to implement new engineering technologies in 3D computer aided design, simulation, parametric modeling, and computational fluid dynamics.